A more gentle alternative for fine and thinning hair. 5 rings of boar bristle tufts stimulate blood flow to the hair roots, the density of the bristles allow conditioning sebum to be more evenly distributed from the roots to the ends of the hair. Mason Pearson Brushes Pure Bristle Pocket Sensitive is rated 4.8 out of 5 by 9. Rated 5 out of 5 by Ali10 from Best brush ever! Finally my fine, fluffy wavy curls look good! I've tried virtually every brush and every styling product on the market and all of them have made my hair worse rather than better. After two weeks of twice daily brushing with this brush my dad - who is the least observant man on the planet (and who didn't know I'd just spent over £50 on a hairbrush!) - looked at me and said: 'You've got shiny curls'. - I've been trying to get those all my life. I'm also losing far less hair each time I brush - it feels much more gentle on my hair and scalp than any other brush or comb and really nice to use. Because my hair is wavy I tend to run a comb through it after I've brushed, otherwise the roots look a bit too flat, but all the tangles seem to have been removed by the brush. It seems to be working miracles and is worth every penny of the price. 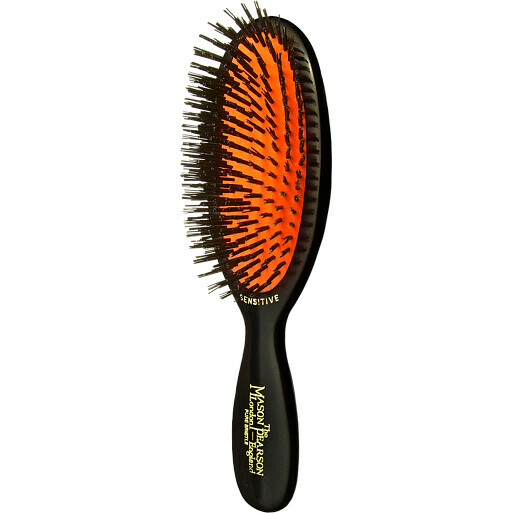 Rated 3 out of 5 by MaryB from It's a hairbrush This is, to me, just a hairbrush, albeit an expensive one. I was wondering whether it was worth paying so much for an every day item but thought I'd give it a try. I did the 'what hairbrush suits your type of hair' assessment and bought the small pure bristle brush, as 'advised'. My hair is thinning as I age (I'm 65) and I suppose I hoped it might stop (or even reverse??) this process. Whilst the hairbrush feels nice on my hairline, after a good hard brushing, I'm not sure it's that much better than my old cheaper brush. And the bristles are not strong enough to go through the really curly bits of my hair. I'm in two minds. There's still a chance it will thicken up my hair but maybe I'm just expecting too much. Rated 5 out of 5 by BerkshireBoss from Better than tangle teezer I used this brand when I was little and I have been having issues with the state of my hair and scalp for a while. I purchased the sensitive pocket when it was on offer and it has been a saviour. I did try tangle teezer but felt it just ripped my hair, this on the other hand is gentle and kind to my hair and leaves it beautifully smooth and knot free.